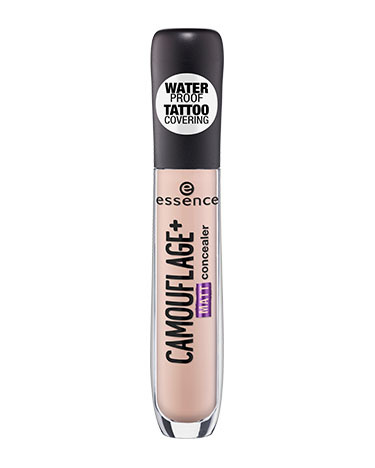 camouflage + matt concealer has a rating of 4.0 stars based on 3 reviews. 10| INGREDIENTS: AQUA (WATER), CYCLOPENTASILOXANE, ISODODECANE, TALC, HYDROGENATED POLYISOBUTENE, ALUMINUM STARCH OCTENYLSUCCINATE, GLYCERIN, POLYGLYCERYL-4 ISOSTEARATE, CETYL PEG/PPG-10/1 DIMETHICONE, HEXYL LAURATE, CYCLOHEXASILOXANE, POTASSIUM CETYL PHOSPHATE, TOCOPHEROL, SODIUM CHLORIDE, PEG/PPG-19/19 DIMETHICONE, CERA ALBA (BEESWAX), DISODIUM EDTA, XANTHAN GUM, ETHYLHEXYLGLYCERIN, BHT, TRIETHOXYCAPRYLYLSILANE, ALUMINUM/MAGNESIUM HYDROXIDE STEARATE, PHENOXYETHANOL, PARFUM (FRAGRANCE), CI 77491, CI 77492, CI 77499 (IRON OXIDES), CI 77891 (TITANIUM DIOXIDE). 20| INGREDIENTS: AQUA (WATER), CYCLOPENTASILOXANE, ISODODECANE, TALC, HYDROGENATED POLYISOBUTENE, ALUMINUM STARCH OCTENYLSUCCINATE, GLYCERIN, POLYGLYCERYL-4 ISOSTEARATE, CETYL PEG/PPG-10/1 DIMETHICONE, HEXYL LAURATE, CYCLOHEXASILOXANE, POTASSIUM CETYL PHOSPHATE, TOCOPHEROL, SODIUM CHLORIDE, PEG/PPG-19/19 DIMETHICONE, CERA ALBA (BEESWAX), DISODIUM EDTA, XANTHAN GUM, ETHYLHEXYLGLYCERIN, BHT, TRIETHOXYCAPRYLYLSILANE, ALUMINUM/MAGNESIUM HYDROXIDE STEARATE, PHENOXYETHANOL, PARFUM (FRAGRANCE), CI 77491, CI 77492, CI 77499 (IRON OXIDES), CI 77891 (TITANIUM DIOXIDE). 30| INGREDIENTS: AQUA (WATER), CYCLOPENTASILOXANE, ISODODECANE, TALC, HYDROGENATED POLYISOBUTENE, ALUMINUM STARCH OCTENYLSUCCINATE, GLYCERIN, POLYGLYCERYL-4 ISOSTEARATE, CETYL PEG/PPG-10/1 DIMETHICONE, HEXYL LAURATE, CYCLOHEXASILOXANE, POTASSIUM CETYL PHOSPHATE, TOCOPHEROL, SODIUM CHLORIDE, PEG/PPG-19/19 DIMETHICONE, CERA ALBA (BEESWAX), DISODIUM EDTA, XANTHAN GUM, ETHYLHEXYLGLYCERIN, BHT, TRIETHOXYCAPRYLYLSILANE, ALUMINUM/MAGNESIUM HYDROXIDE STEARATE, PHENOXYETHANOL, PARFUM (FRAGRANCE), CI 77491, CI 77492, CI 77499 (IRON OXIDES), CI 77891 (TITANIUM DIOXIDE).